Color overlay of fluorescently labeled rat neurons. 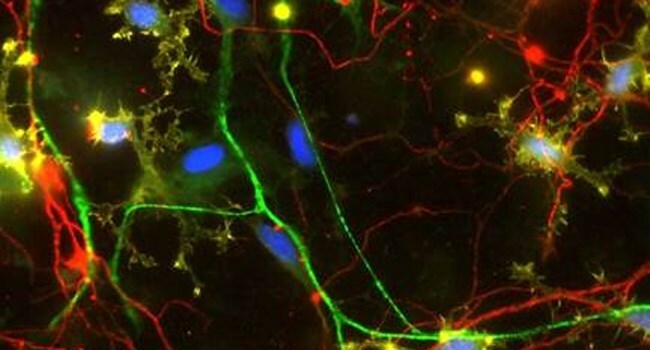 The structures labeled are nuclei (blue), nestin neurofilaments (green), neuron-glial antigens (yellow), and microtubules (red). Image taken with the optiMOS™ Scientific CMOS camera from QImaging. In the world of research and science, a very unique and specialized type of camera is used to capture images – at the molecular level, where the world is quite different, possessing a beauty all of its own. Very few of us will ever know about or see the images that are captured with the cameras that are used to improve and advance the quality of our lives. These are the scientific cameras. Also known as microscopy cameras because to do their job, they must attach to a microscope which is used to magnify the sample being imaged. Simply put, the microscope and camera together, enable researchers and scientists to see patterns, reactions and changes in how cells behave and function. Their goal? To provide answers, so we all can benefit from new discoveries.